Atlanta Pedestrian Accident Attorney - Record Setting $$ Verdicts! Every year, thousands of Georgia pedestrians suffer serious injuries as the result of motor vehicle collisions. Many of these injuries require lengthy recovery times and others result in death. In busy cities like Atlanta, negligent driving behaviors pose severe risks to pedestrians. If you suffered serious injuries from a pedestrian-motor vehicle collision, you may be eligible for financial compensation for your losses. The Atlanta pedestrian accident lawyers at Butler Wooten & Peak LLP can help you determine your legal options and find the optimal pathways toward a successful outcome. Our clients trust our award-winning firm for our significant experience litigating multiple types of personal injury cases, including pedestrian accidents. Our attorneys have successfully represented clients throughout over 30 states in multiple areas of personal injury law, class action suits, and more. Our firm has years of experience performing full-scale investigations, recovering evidence you may not have access to. Butler Wooten & Peak, LLP operates on a contingency fee basis to reduce your legal fees. If we do not recover a settlement on your behalf, we will not collect any payment. How is Fault Determined in a Pedestrian Accident Case? In determining eligibility for compensation, one must first consider civil liability for the pedestrian accident. “Pedestrians always have the right of way” is a common misconception in Atlanta. While drivers do have to yield to pedestrians in most cases, walkers must still obey traffic signals and walk signs. Stepping out into traffic without waiting for the walk signal can lead to liability for a subsequent collision – at least in part. To succeed with a personal injury lawsuit, the plaintiff will need to prove the negligence of the defendant and that the defendant’s negligence directly resulted in the plaintiff’s damages. It is the plaintiff’s responsibility to establish that the defendant owed a duty of care under the circumstances and then show the court how the defendant violated their duty. Next, the plaintiff will need to provide evidence that shows the extent of his or her losses and proof they resulted directly from the defendant’s negligence and not some other cause. While a pedestrian accident involving a driver striking a pedestrian may seem like a straightforward case, this isn’t always true. It’s possible for a pedestrian to share some of the liability for a pedestrian accident. Comparative negligence is a common defense tactic in pedestrian accidents in Atlanta. The vehicle driver could allege that the pedestrian was texting and walking, then stepped into the crosswalk without looking for oncoming traffic. In the event that the courts split liability between the plaintiff and the defendant, this does not bar the plaintiff from financial recovery. Georgia’s modified comparative negligence laws offer the opportunity for compensation as long as the plaintiff is less than 50% at fault for the incident. If a plaintiff shares any fault for the accident in question, a jury assigns a fault percentage to all parties involved. The plaintiff then loses his or her fault percentage of the case award. For example, in a $50,000 case in which the plaintiff is 10% at fault, the plaintiff loses 10% or $5,000 of the awarded compensation, receiving $45,000 instead. Minimizing your own degree of fault for a pedestrian accident can require help from an attorney. A lawyer can investigate the collision, gather eyewitness statements, and hire expert witnesses to testify on your behalf. These measures may help prove the driver of the vehicle was mostly or entirely at fault for your injuries. You have two options for pursuing legal action for a pedestrian accident. You can file a claim with the at-fault driver’s insurance company or you can file a personal injury lawsuit in civil court. You have two years from the date of your injuries to file a personal injury lawsuit against a driver in Georgia. If you receive an insurance settlement from the at-fault driver, you cannot file an additional lawsuit. If you have significant injuries that exceed an insurance company’s policy limits, we recommend that you file a personal injury claim to increase the maximum compensation you could collect. What Kinds of Damages Can Be Claimed in Pedestrian Accident Lawsuits? Your personal injury attorney will have to prove liability in order to effectively argue for the optimal settlement amount. Georgia courts follow a modified comparative negligence rule to determine liability and the final settlement. If the jury finds you to be responsible for a portion of the accident, the court will reduce your final settlement amount by that percentage. If you are responsible for 50% or higher, you will not receive a settlement. For example, say that you receive a settlement for $200,000 at the end of your case. However, the courts discover that you entered the street on a roadway that had traffic-control signals. The jury can find you to be responsible for 40% of your accident. You will receive a settlement of $120,000. What are the Top Causes of Pedestrian Accidents? Multiple factors can cause pedestrian-motor vehicle accidents in Georgia. Causes range from purely accidental to reckless and negligent. Similar common causes lead to pedestrian injuries and fatalities on United States roads as well as local roads in Georgia. The sheer size and force of an oncoming vehicle can cause serious damage to an unprotected pedestrian. Many of these accidents end in severe, life-threatening injuries that can cause disability and death. Injuries from pedestrian accidents can require expensive medical treatments, surgeries, medications, and special mobility equipment. In addition, some victims will require months or even years of recovery time. Many people permanently lose functions in some body parts and have to mitigate their injuries for the rest of their lives. Georgia statutes give different rights and protections to pedestrians in accidents. Depending on the location of the accident and the presence of crosswalks, pedestrians receive certain right of way privileges on Georgia roads. Pedestrians have the right of way in crosswalks. Drivers of motor vehicles must stop and wait for a pedestrian to complete crossing before continuing to drive. According to a 1995 statute, Georgia drivers cannot simply yield for a pedestrian. They must come to a full stop. Jaywalking is not a crime in Georgia. If a pedestrian enters a street that does not have a crosswalk, he or she will need to yield to oncoming traffic and cross safely. The pedestrian has the right of way if he or she enters the intersection safely prior to a vehicle approaching. Pedestrians have to follow pedestrian control signals and use marked crosswalks whenever available. However, a pedestrian is not liable for an accident simply for not using a crosswalk in Georgia. What are the Current Georgia Pedestrian Accident Statistics? Pedestrian accidents are unfortunately common on Georgia streets. Many people lose their lives due to negligent drivers and sudden accidents. According to the most recent NHTSA data, 253 people died from pedestrian collisions in 2017 alone. The state government is attempting to implement safety measures to reduce these statistics. 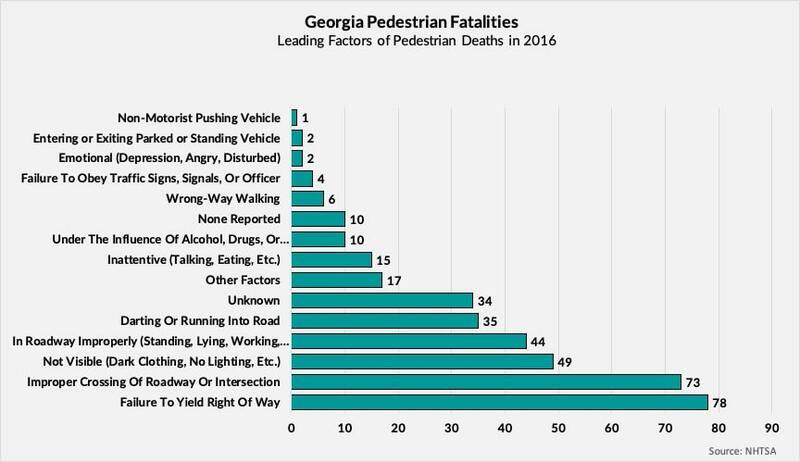 Here is the breakdown of pedestrian deaths in Georgia in the last decade. According to the Georgia Governor’s Office of Highway Safety, pedestrian accidents and deaths are increasing in Georgia at an unfortunately high rate. In 2015, 193 pedestrians died in motor vehicle fatalities. Pedestrian fatalities made up 13.5% of all motor vehicle fatalities in Georgia during 2015. 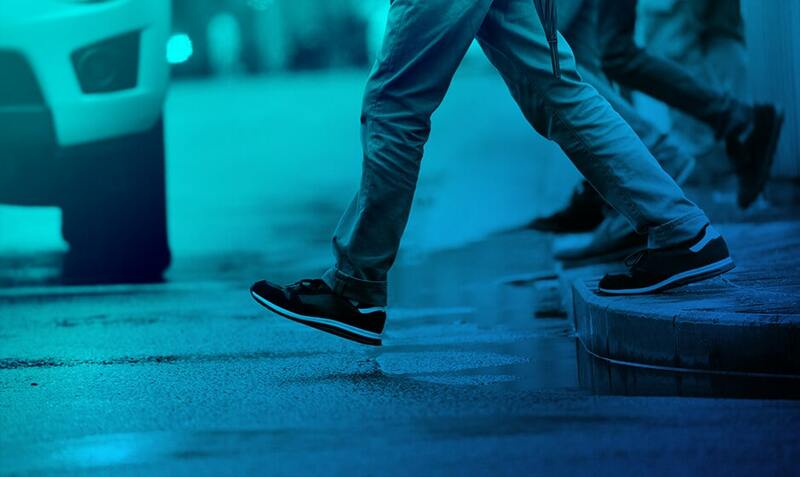 The number of pedestrian fatalities in 2015 increased by 18.4% from 2014. Across the United States, 5,376 pedestrians died in traffic accidents in 2015. This statistic increased by 9.5% from 2014. Since 2006, the number of pedestrian fatalities in the United States increased from 11% of all traffic fatalities to 15%. If you suffered injuries in a pedestrian accident in Georgia, contact a personal injury attorney from Butler Wooten & Peak today. Our attorneys can provide numerous services and benefits for your personal injury lawsuit, allowing for a simpler litigation experience. We will conduct a full-scale investigation into the circumstances of your accident. We will review security footage, gather witness testimony, analyze medical records, and consult with medical experts to craft a strong case on your behalf. We will file all paperwork and handle all court communications so that you can focus on your recovery, not deadlines and confusing legal documents. Our team will ensure open, honest communication every step of the way. Our attorneys are available to answer any questions you may have, ensuring that you stay informed about your case from consultation to settlement. Your Atlanta pedestrian accident attorney will enter into negotiations with insurance companies on your behalf, arguing for your right to appropriate compensation for all potential losses covered by various policies. For help with pedestrian accident claims in Georgia, call the accident lawyers at Butler Wooten & Peak, LLP in Atlanta at (404) 321-1700 or toll-free at (800) 242-2962 or get in touch online.